Conspiracy theorist Alex Jones said that he was interviewed for public radio show This American Life and that the episode will air “in a couple weeks.” While Jones predicted that the show will not offer an accurate portrayal of him, he explained that he was willing to be interviewed to take advantage of This American Life’s large audience. A producer at This American Life confirmed to Media Matters that the show is working on something “related” to Jones but declined to comment further. If Jones’ claim of the show interviewing him is true, This American Life would be the first major mainstream media platform to host Jones since his June 2017 appearance on Megyn Kelly’s since-canceled NBC show Sunday Night with Megyn Kelly. While approximately 3.5 million people watched Jones’ appearance with Kelly, This American Life has an average of 4.7 million weekly listeners. 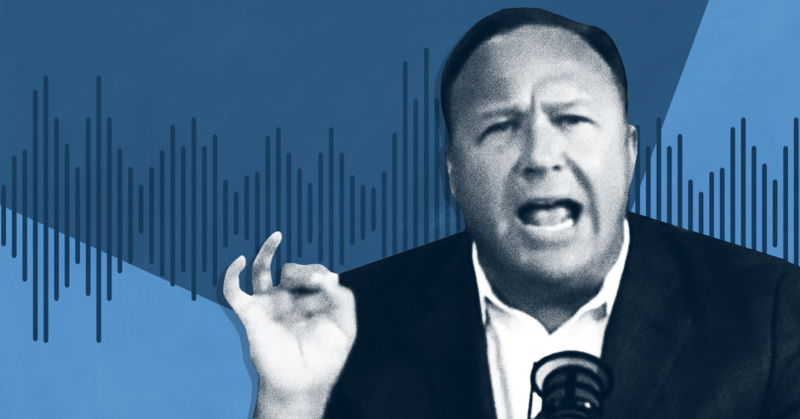 In a video posted on February 15 to Jones’ Infowars website, Jones said he was interviewed by journalist Jon Ronson, whom he says he has known for 20 years and who has contributed stories to This American Life in the past. Jones claimed that he told Ronson, “I know you're manipulating people, but I'll go on your NPR show because it does have 5 million listeners.” (While This American Life airs on many public radio stations that also present NPR's content, it is independently produced.) Jones also said that This American Life has been interviewing people from his hometown of Rockwall, TX. By claiming that his interviewer attempted to flatter him with the promise of positive coverage and that he recorded all of their interactions, Jones is employing the same tactics he used in the lead-up to his appearance with Kelly. Responding to backlash around NBC’s decision to give Jones a platform, NBC News Chairman Andrew Lack said before the interview aired that “the story would be edited with the sensitivity of its critics in mind,” according to The Guardian. Jones' claims about This American Life interviewing him should be treated with skepticism, but if what he says is close to true, the program appears poised to repeat NBC’s mistakes. Media outlets including NPR and Fox News are targeting federal disability benefits programs through a campaign deceptively portraying these programs as wasteful and unsustainable. In reality, these programs have low fraud rates and help the rising number of Americans with severe disabilities survive when they are unable to work. Under fire for a sloppy report that leaned on anecdotal evidence to make sweeping generalizations about federal disability benefits, NPR has edited portions of that report even as Ira Glass publicly defends the initial reporting. On March 22, Media Matters highlighted several myths and errors in a report from NPR's Planet Money about Supplemental Security Insurance, a federal disability program for children. The report drew further criticism, and more than 100 organizations that advocate for and support people with disabilities have signed a letter criticizing the piece, saying it "paints a misleading and inaccurate picture of the Social Security programs that serve as a vital lifeline for millions of Americans with severe disabilities." On March 26, This American Life host Ira Glass responded to Media Matters' criticism by claiming he stood by his program's work, saying "our report on disability programs was fact checked line by line by an outside fact checker, in addition to fact checking by the reporter and her editors" and that "We know of no factual errors. We stand by the story." But while Glass publicly claimed to stand behind the story, Wired Business senior writer Ryan Tate has noted that the online text version of the radio program has been altered since its original posting. NPR has since said that the changes were made "for clarity after publication." This American Life host Ira Glass has been called out by the Center for Economic and Policy Research for citing data with "limited relevance to contemporary policy debates" to defend his misleading report on disability benefits. Last week, Media Matters detailed how the report, which was also featured on the NPR programs Planet Money and All Things Considered, pushed a series of myths about Supplemental Security Insurance (SSI) -- a Social Security program that supports families that include children with disabilities -- over the program's growth rate, qualification challenges, and successes it has had in reducing poverty among children with disabilities. The report was quickly picked up by right-wing media outlets who used it to advance the false claim that increased disability benefits indicate fraud in the system. Following harsh criticism that the report presented a false picture of disability programs Glass stood by the story, saying in a statement to the International Business Times that "our report on disability programs was fact checked line by line by an outside fact checker, in addition to fact checking by the reporter and her editors" and "[w]e know of no factual errors. We stand by the story." Finally, Glass takes issue with an analysis that I did with Rebecca Vallas, one cited by Media Matters, showing that the recent rise in the number of children with severe disabilities receiving Supplemental Security benefits is largely due to economic factors. Glass says: "They [Media Matters] choose data from 2000-2009 to back up that claim.... As we point out in our reporting, when you look at a longer period of time -- at 30 years of economic data -- you see a different story." But neither Glass nor Joffe-Walt say what that "different story" actually is. Vallas and I have focused -- for example in this paper for the National Academy of Social Insurance -- on the trends over roughly the last 15 years because Supplemental Security's eligibility standards for children have been stable since then (the figure below is from this paper). Before that SSA's eligibility standards for children were expanded (in 1990 by a conservative Supreme Court that ruled 7-2 that SSA's regulations were much stricter than the underlying federal law) and then pared back somewhat (by Congress in 1996 after the Gingrich Revolution). In telling the story of Supplemental Security today, the primary focus should be on trends from recent history that represent a mature, stable program. If reporters want to also tell the story of the implementation and early history of children's SSI, that's fine, but they should be clear it is a much different story that has limited relevance to contemporary policy debates. They should also go back and read this 1995 Forbes Media Critic piece, "Media Crusade Gone Haywire," detailing the role that dubious sources and anecdotes fed the last major round of media hysteria on this issue. This American Life host Ira Glass is defending a recent report on his program in the face of criticism from those who say it painted a false picture of disability programs. On March 22, Media Matters detailed how the public radio segment, which also ran on the NPR programs Planet Money and All Things Considered, promoted several myths to criticize Supplemental Security Insurance over the program's rate of growth, hurdles towards qualification, and successes it has had in reducing poverty. The story drew further criticism from Center for Economic and Policy Research co-director Dean Baker, who said it "got some of the basics wrong," and University of Connecticut law professor James Kwak, who said it suffers from "facile extrapolation from the individual story to national policy." But in a statement to International Business Times, Glass stood by his program's work. He told IBT that "our report on disability programs was fact checked line by line by an outside fact checker, in addition to fact checking by the reporter and her editors" and that "We know of no factual errors. We stand by the story." Right-wing media outlets have latched on to the report, which also ran on the NPR programs Planet Money and All Things Considered, and used it to amplify their false message that increased disability benefits indicate fraud in the system. National Review praised the report as "brilliant" and the Washington Examiner offered it as evidence that disability benefits are "a voluntary life sentence to idle poverty." Breitbart.com praised NPR "for reporting the truth--a truth that conservatives have been highlighting for decades." Public radio program This American Life pushed a series of myths about Supplemental Security Insurance (SSI), a Social Security program that supports families that include children with disabilities. The piece ignored that the recent rise in disability benefits is tied to the recession and higher rates of poverty, that qualifying for benefits is difficult, that SSI encourages employment, and that the current program has significantly reduced poverty among children with disabilities.